Christiania according to the wikipedia is a controversial, partially self-governing neighbourhood of about 850 residents, covering 34 hectares (85 acres) in the borough of Chistianhavn in the Danish capital, Copenhagen. A former military camp, it was occupied by homeless people in Copenhagen in 1971. A few weeks after, it was proclaimed as a free town by a writer named Jacob Ludvigsen. Christiania quickly became associated with the hippie movement and cannabis. Recently, the Danish government has been trying to "normalize" the situation in Christiania and so open drug dealing was put to a halt. 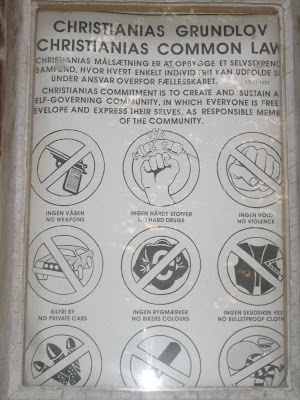 Since Christiania is partially self-governing, they are not subject to building laws. 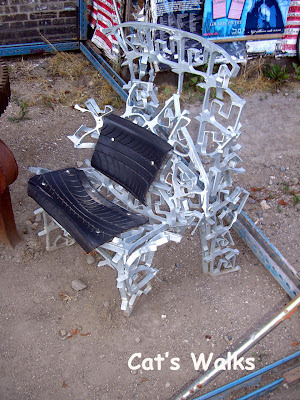 The result is fresh and eclectic furniture design and architecture found nowhere else in Europe. 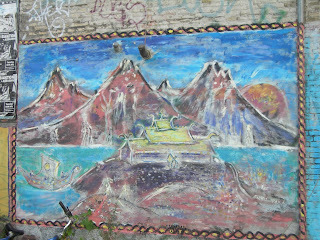 In the entire city, murals adorn all the building walls and raggae music plays loudly in the background. 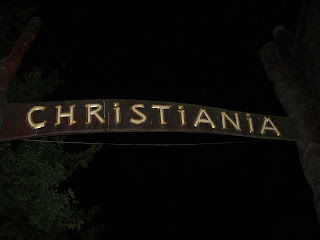 When some friends and I went to Christiania a few years ago, we saw it with romantic eyes. Eyes of PhD students drowning in our work. What we saw were people doing what they want, when they wanted it. It made us stop and think if really so much hardwork is required in this life. Wouldn't it be so much nicer if we would be free of the strict rules of this world and free from needing to blindly run the rat race like the people of Christiania? We were contemplating this when we started chatting with an old man selling nice Tibetan jewelry. We started telling him about our romantic ideas about Christiania and how we think he is so lucky to have seen the world. His advice? We should continue slaving our ourselves because in the end what matters is that you have a health insurance and a pension. =( Doesn't that make you want to cry?